January 31, 2019 at 8:40 PM Accident on southbound Hwy 49 at Lime Kiln Road. Emergency services on scene of a pickup truck off the roadway. January 31, 2019 at 1:54 PM An update from the NWS Sacramento forecasts very low snow levels on Monday. January 31, 2019 at 10:30 AM Smoke from a control burn at the old Quail Valley Golf Course off of Auburn Rd near Hidden Valley is visible in Nevada and Placer counties. This is a prescribed fire, no need to report the smoke. January 31, 2019 at 8:37 AM Heavy precipitation Friday night through the weekend with significant mountain snow and strong winds at times. A Winter Storm Watch is in effect for Friday evening through early Monday. A winter storm will bring heavy snow to elevations above 5000 feet this weekend, with lighter snow amounts possible down to 3000-4500 feet. Gusty winds with gusts up to 50 mph. January 31, 2019 at 8:26 AM Today is a permissible burn day in Nevada, Placer, Plumas and Sierra Counties. Burning is always prohibited in the city limits of Grass Valley and Nevada City. A burn permit from the fire department is always required in Truckee. For maximum smoke dispersion, please burn between 9 AM and 3 PM. In the American and Thompson Valleys (all areas within the Quincy Fire Protection District), residential open burning is prohibited until March 16. Burning is always prohibited in downtown Quincy and East Quincy. It is illegal to burn painted or treated wood, plywood, plastic or anything other than natural vegetation from the property where you are burning. It is also illegal to burn piles comprised mainly of leaves or pine needles. For maximum smoke dispersion, please burn between 9 AM and 3 PM. January 30, 2019 at 12:39 PM Accident on Lakeshore S in Lake of the Pines, reported head injury. Emergency services are on scene. January 30, 2019 at 8:18 AM Rain and snow return, heaviest impacts Friday through Monday. The weather pattern is expected to turn wetter over the weekend. Some light precipitation may fall between today and Friday but heavier precipitation is not expected until Friday night. This is when the heaviest precipitation is expected but periods of rain and mountain snow will continue through early next week. January 30, 2019 at 7:54 AM Today is a permissible burn day in Nevada, Placer, Plumas and Sierra Counties. Burning is always prohibited in the city limits of Grass Valley and Nevada City. A burn permit from the fire department is always required in Truckee. For maximum smoke dispersion, please burn between 9 AM and 3 PM. In the American and Thompson Valleys (all areas within the Quincy Fire Protection District), residential open burning is prohibited until March 16. Burning is always prohibited in downtown Quincy and East Quincy. It is illegal to burn painted or treated wood, plywood, plastic or anything other than natural vegetation from the property where you are burning. It is also illegal to burn piles comprised mainly of leaves or pine needles. For maximum smoke dispersion, please burn between 9 AM and 3 PM. January 29, 2019 at 7:40 PM Overturned vehicle on Hwy 49 at Rush Creek, both lanes are blocked. Emergency services are on scene, no injuries reported. January 29, 2019 at 2:10 PM The Nevada County website is fully functional again. The vendor has resolved the issue. January 29, 2019 at 10:42 AM Nevada County’s website is experiencing technical difficulties. All county offices and services are operating normally. January 29, 2019 at 7:53 AM Trio of systems creating active weather pattern with low snow levels on Sunday. An active weather pattern ahead with multiple chances for precipitation this week. The most impactful period will likely be Friday through Sunday as a pair of Pacific systems move through the region. Snow levels at, and below pass level, will likely lead to mountain travel delays and chain controls. January 29, 2019 at 7:40 AM Today is a permissible burn day in Nevada, Placer, Plumas and Sierra Counties. Burning is always prohibited in the city limits of Grass Valley and Nevada City. A burn permit from the fire department is always required in Truckee. For maximum smoke dispersion, please burn between 9 AM and 3 PM. In the American and Thompson Valleys (all areas within the Quincy Fire Protection District), residential open burning is prohibited until March 16. Burning is always prohibited in downtown Quincy and East Quincy. It is illegal to burn painted or treated wood, plywood, plastic or anything other than natural vegetation from the property where you are burning. It is also illegal to burn piles comprised mainly of leaves or pine needles. For maximum smoke dispersion, please burn between 9 AM and 3 PM. January 28, 2019 at 5:23 PM NWS Update: After a week of dry weather over northern California there will be a return to wet weather. A very weak weather system will move through the area late tonight and Tuesday bringing very light rain to portions of the Valley and very light snow to the mountains. A second weather system will move southward along the coast Wednesday and Thursday bringing rain mostly to the coastal range. Rainfall will taper off significantly east of the coastal range and into the Central Valley. Only a couple of inches of snow is forecast over the higher Sierra elevations. By the end of the week and into the weekend wetter and colder storms will affect northern California. 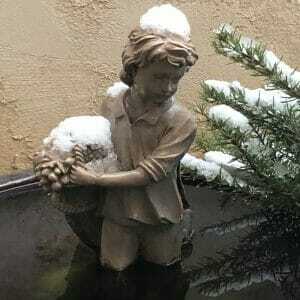 Over an inch of rain is expected in the Valley with several feet of snow over the high Sierra. Several inches of snow are expected to fall over the trans-Sierra passes Friday afternoon and evening and may result in chain controls and travel delays. On Saturday and Sunday snow levels will fall to around 3500 to 4000 feet with snow continuing to accumulate through Sunday night. Impacts to travel can be expected this weekend. Expect winter driving conditions if traveling to the mountains, and wet roads in the Valley and Foothills. January 28, 2019 at 8:24 AM Today, Monday January 28, is a No Burn Day in Yuba and Sutter counties due to poor air quality. January 28, 2019 at 7:22 AM Today is a NO BURN day in Nevada, Placer, Plumas and Sierra counties. January 28, 2019 at 7:19 AM Wet pattern returns, storm door wide open next weekend. 0.25-0.50″ can be expected over the Valley on Wed with the bigger threat looming Fri and into the weekend. January 28, 2019 at 7:00 AM Preparing for Wildfire Season in Nevada County – Week 8: Family Emergency Plan. The best plan is of little value if never tested. Once you have your plan ready, practice. Conduct your own personal drill with all your household members, including your pets. If you have ever tried to put a reluctant cat in a carrier you know this takes more than a minute. January 27, 2019 at 11:48 AM Vehicle accident on Indian Springs Road near Spenceville Road. Emergency services en route. Vehicle vs two bicycles. January 27, 2019 at 10:08 AM CAL FIRE/Butte County Fire at scene of a technical rescue at Ponderosa Dam in Robinson Mill. One vehicle 200 feet down a cliff with multiple patients. Rescue in progress. 6 Engines, 1 Rescue and 2 Helicopters committed. January 26, 2019 at 9:00 AM Today is a NO BURN day in Nevada, Placer, Plumas and Sierra counties. January 26, 2019 at 12:07 AM Use caution on Hwy 49 between the Independence Trail and the 49er bridge. Solo vehicle partially blocking the roadway. Emergency services on scene. January 26, 2019 at 12:01 AM All fire units are clear from the accident on Hwy 174. CHP will reopen both lanes in approximately five minutes. January 25, 2019 at 11:53 PM Vehicle accident on Hwy 174 near Greenhorn Access Road. One lane only open at this time. Emergency services are on scene, single vehicle on its side. The driver has fled the scene. Any information about the accident or the driver, please call 911. USED CLOTHING DRIVE THIS SATURDAY!! Gather those ugly old sweaters and mismatched towels for the Safe and Sober Grad Night Used Clothing Drive. De-clutter closets by donating the shirts, shoes, and pants you never wear. Rid your house of old blankets, sheets, pillows, stuffed toys, and even purses. All donations help fund our Safe and Sober Grad Night celebration for our 2019 graduates. Dollars raised by textile pound, no matter the condition. Thank you for supporting our class of 2019! January 25, 2019 at 5:06 PM Accident on northbound Hwy 49 near Reader Ranch Road, emergency services en route. Please reduce your speed and use extreme caution in the area. January 25, 2019 at 8:49 AM Today is a NO BURN day in Nevada, Placer, Plumas and Sierra counties. January 25, 2019 at 8:13 AM Dry and warm winter weekend ahead. High pressure will bring a fairly nice weekend. Daytime highs above normal with just some morning fog and some variable high clouds on Sunday. January 25, 2019 at 8:09 AM Traffic light hit by big rig on Hwy 20 at Pleasant Valley Road. Caltrans has been notified. January 24, 2019 at 5:07 PM Accident on Hwy 49 at Oak Tree Road in North San Juan. Two cars involved, no injures reported. January 24, 2019 at 12:00 PM Non-injury accident on northbound Hwy 49 at Combie Road. Propane truck vs a Camry. Both vehicles are on the right-hand side, the roadway s clear. January 24, 2019 at 6:36 AM Warming temperatures and at times breezy winds. Northern California will see warming temperatures through the coming weekend as high pressure builds over the west coast. Daytime highs will reach to between 10 and 15 degrees above normal. January 24, 2019 at 6:33 AM Today is a NO BURN day in Nevada, Placer, Plumas and Sierra counties. January 23, 2019 at 5:02 PM Per CAL FIRE: Traffic slow due to a collision with the center divide, solo vehicle, Interstate 80 westbound at Nevada Street in Auburn. January 23, 2019 at 7:38 AM Storm track shifts northward leaving high pressure and dry weather behind. Storm track has shifted northward this week, with dry and mild temperatures continuing through at least the middle of next week. January 23, 2019 at 7:34 AM Today is a NO BURN day in Nevada, Placer, Plumas and Sierra counties. January 22, 2019 at 9:24 AM The roadway is clear, all debris removed on Bitney Springs. January 22, 2019 at 9:11 AM Traffic on Bitney Springs is backed up due to an overturned vehicle. Emergency services are on scene. January 22, 2019 at 7:01 AM Dry and mild this week. We are going to see quiet weather this week with mild daytime highs and chilly overnight lows. January 22, 2019 at 6:49 AM Today is a NO BURN day in Nevada, Placer, Plumas and Sierra counties. January 21, 2019 at 7:32 AM Today is a NO BURN day in Nevada, Placer, Plumas and Sierra counties. January 21, 2019 at 7:29 AM A week of dry weather ahead. After a period of wet weather, an extended period of dry weather is expected across interior NorCal for the remainder of the week into next week. January 21, 2019 at 7:00 AM Preparing for Wildfire Season in Nevada County – Week 7: Burn piles is now published. January 20, 2019 at 4:22 PM NWS 4:20pm update – All tornado warnings have been allowed to expire. January 20, 2019 at 3:30 PM Tornado Warning for northeastern Stanislaus & southwestern Calaveras Counties. Storm is about to move over Telegraph City. Take cover now if in the path of this storm! January 19, 2019 at 10:31 AM Light precipitation today, hazardous mountain travel Sunday. Light showers will continue today for locations north of I-80. A moderately strong winter storm will bring widespread precipitation Sunday, with hazardous mountain travel developing during the late afternoon and evening hours. Snowfall accumulations of up to 2 feet will be possible over the high mountain passes, creating significant travel issues. Precipitation will end Monday afternoon; an extended period of dry weather is likely next week. January 18, 2019 at 8:48 AM A moderately strong weather system will be moving through northern California on Sunday. This system will bring several inches of snowfall to the Sierra passes right in the middle of the MLK JR holiday weekend. Be prepared for winter travel if going through the Sierra on Sunday. January 18, 2019 at 8:44 AM Caltrans update for I-80: Big rigs are now cleared for travel over Donner Summit. EB/WB R-2 chain controls from Kingvale to Truckee. Please #BeAlert and travel slowly as there will be many vehicles on the road today. January 17, 2019 at 1:08 PM Tree into the power lines, lines are down on the roadway in Colfax. Emergency services en route. January 17, 2019 at 10:40 AM Units at scene on Little Valley report this is the same incident they responded to last night. No damage to any propane tanks. 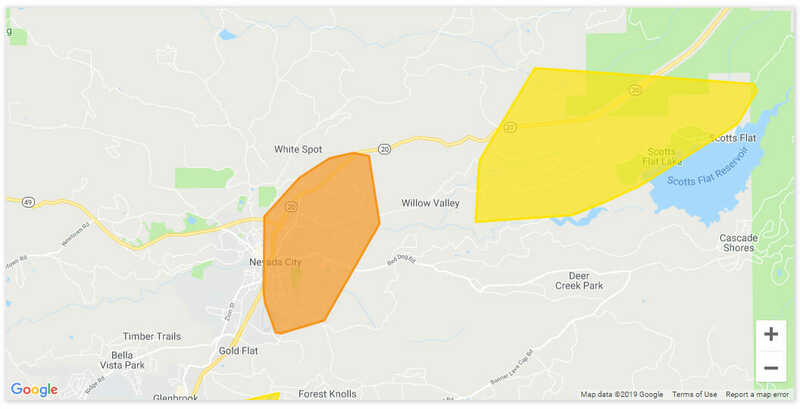 January 17, 2019 at 10:38 AM The large power outage in Nevada City has been resolved by PG&E crews, only 42 homes remain in the outage area. 207 homes are still out along Hwy 20 and Willow Valley Road. January 17, 2019 at 10:32 AM Power lines down on Little Valley Road off Hwy 49 at the Amerigas storage facility. Emergency services en route. January 17, 2019 at 8:32 AM Snow in the high country, showers and breezy winds elsewhere – flooding continues. Heavy snow continues across the northern Sierra Nevada today and tonight with lowering snow levels. January 17, 2019 at 8:26 AM Caltrans I-80 UPDATE: R-2 chain controls EB/WB from Drum to Truckee. ALL big rigs being turned. We’ll reevaluate around noon and reopen if weather conditions do not worsen. January 17, 2019 at 7:56 AM Numerous power outages still ongoing. as well as many individual outages. January 16, 2019 at 11:14 PM Power lines down on Lime Kiln Road, PG&E is being notified. January 16, 2019 at 10:58 PM Power outage from the Town of Washington to Downieville, Sierra City and Bassetts area. 1,232 homes affected. January 16, 2019 at 10:24 PM Hwy 20 eastbound is now closed from Nevada City to Omega. January 16, 2019 at 10:03 PM Report of a blown transformer on Pine Street in Nevada City. Units en route. PG&E reports 1,078 homes out of power. Second outage along Hwy 20 from Willow Valley to Scotts Flat affecting 207 homes. Crews en route. January 16, 2019 at 9:47 PM Power outage along Banner Lava Cap Road near the reservoir affecting 98 homes. PG&E has assigned a crew to assess the outage. January 16, 2019 at 9:45 PM Update: Truckee Police and allied agencies have cleared the scene, the shelter in place order has been lifted and residents are able to return to their homes. We apologize for any inconvenience or fear this may have caused our community but due to the nature of this event, we’re unable to release further details. January 16, 2019 at 9:15 PM Vehicle stuck in a ditch on southbound Hwy 49 at Little Valley Road, partially blocking one lane. Reduce your speed! January 16, 2019 at 8:21 PM Tree in the roadway on southbound Hwy 20, just past the junction of Hey 49. January 16, 2019 at 7:56 PM Roadway blocked on Mt. Vernon Road near Shanley Road. Tree and power lines down. January 16, 2019 at 7:42 PM Unit at scene on Lone Heron report a small chimney fire, they can handle. All remaining units are being canceled. January 16, 2019 at 7:32 PM First unit has arrived at Lone Heron Court, reports nothing showing. All incoming units to stage at Quail Creek and Lone Heron. January 16, 2019 at 7:29 PM Accident on La Barr Meadows Road at Dog Bar Road, no injuries reported. January 16, 2019 at 7:25 PM Units en route to the structure fire request two additional water tenders and one engine to respond. No units on scene yet. January 16, 2019 at 7:23 PM Residential structure fire on Lone Heron Court off Quail Creek in Alta Sierra. Numerous engines en route. January 16, 2019 at 7:16 PM Large boulder in the roadway on eastbound Hwy 20 near Smartsville Road. January 16, 2019 at 7:15 PM Tree blocking the lanes on Rollins Lake Road. January 16, 2019 at 7:02 PM Tree in the power lines on Magnolia Road, engines en route. January 16, 2019 at 6:43 PM Possible blown transformer on Bitney Springs Road, engines en route. January 16, 2019 at 6:39 PM Tree in the roadway on Bitney Springs Road near Starduster Drive, one lane is blocked. Emergency services en route. January 16, 2019 at 6:24 PM Truckee PD responding to a subject with a firearm on Briar circle. The situation is still developing. 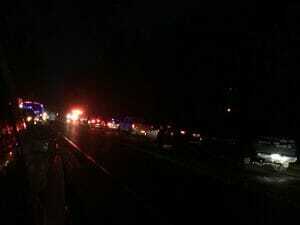 Truckee Police officers and neighboring law enforcement remain on scene at Briar Circle and the surrounding areas. Officers responded to a report of a subject who had barricaded themselves within a residence after making suicidal statements. The situation is still developing and we’ll have more information as it becomes available. The Truckee Police Department is advising residents in the area to remain indoors until further instruction from law enforcement. Stay tuned to Nixle and our media outlets for further updates. January 16, 2019 at 6:08 PM Report of a vehicle over the embankment near little Valley Road/Alta Sierra Drive on Hwy 49. Emergency services en route, car is reportedly hung up in trees. January 16, 2019 at 6:02 PM Caltrans: SR20 EB turning all trucks in Nevada City due to traction problems over the summit. January 16, 2019 at 5:56 PM Several power outages affecting Yuba City and Sutter. Over 4,500 people out of power, no cause or estimated time of restoration yet. January 16, 2019 at 5:53 PM Power outage on Lasso Loop is affecting 32 homes at this time. PG&E has assigned a crew to assess the outage. January 16, 2019 at 5:42 PM Power lines in the roadway on Lasso Loop near Willow Lane in Penn Valley. Emergency services are on scene. The power lines are a service drop to several homes. PG&E has been notified. January 16, 2019 at 5:12 PM Vehicle accident on Indian Springs near Spenceville Road. Emergency services en route. January 16, 2019 at 5:04 PM Vehicle spun out on southbound Hwy 49 at the Dorsey Drive ramp. Emergency services are on scene. Reduce your speed and give yourself extra time to get home – safely. January 16, 2019 at 3:34 PM Vehicle spinout reported on eastbound Hwy 20 near Penn Valley Drive. Emergency services en route. January 16, 2019 at 3:14 PM Emergency services en route to an accident on Newtown Road near Jones Bar Road. January 16, 2019 at 10:59 AM Non-injury accident on Wolf Road, approximately 200 ft from the intersection with Hwy 49. January 16, 2019 at 9:52 AM Power outage in Lake Wildwood has been reduced to 886 homes. PG&E crews are on site of two down power lines and a sheared-off pole. Restoration time is estimated to be 11:45 am. January 16, 2019 at 9:20 AM Power outage in Alta Sierra in the Sky Pines Road area is affecting 154 customers. PG&E assessment crew is en route to the outage. January 16, 2019 at 8:37 AM Units on scene at Brock Road in Nevada City report the line in the roadway is a cable line, not a power line. Comcast is being notified. 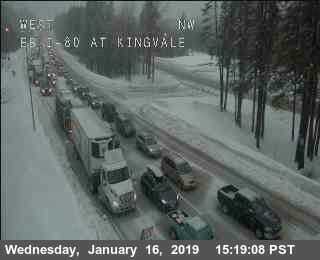 January 16, 2019 at 8:36 AM I-80 single axel and double big rigs being turned due to severe weather over the Summit. EB turned at Applegate, WB turned at Truckee and Nevada state line. EB Hwy 20 single axle and double big rigs turned at I-80 junction. No ETO. January 16, 2019 at 8:32 AM Reported power lines down on Lindley Ave and Brock Road in Nevada City. Emergency services en route. January 16, 2019 at 8:28 AM Power lines down in Lake Wildwood, emergency services are en route. 1,173 customers without power, PG&E has assigned a crew to assess the outage. January 15, 2019 at 10:46 PM Tree down, blocking the entire roadway on Cooper Road near Rock Creek Road in Nevada City. January 15, 2019 at 10:43 PM Caltrans has reopened Sierra WB I-80 to travelers due to earlier avalanche. January 15, 2019 at 10:25 PM Caltrans: Sierra WB I-80 Traffic is being turned back at the Nevada Stateline due to an avalanche. Expect delays until Caltrans clears the roadway. January 15, 2019 at 5:16 PM Major mountain travel impacts, strong winds, and localized flooding due to heavy rains starting Wednesday afternoon. The wet weather pattern is underway as the next system currently moving through spreads moderate rain and mountain snowfall to the region. A Winter Weather Advisory remains in effect from Tuesday evening through Wednesday evening. A much stronger winter storm will follow in its wake impacting Northern California Wednesday afternoon through Thursday night. Moderate to heavy rain and snow is possible, especially Wednesday evening into Thursday, with a few thunderstorms possible during that period of time. Across the mountains, a Winter Storm Watch has been issued spanning Wednesday night through Thursday night. This system will also bring strong Valley and mountain winds Wednesday night through early Thursday. Downed power lines and trees are possible as well as limited visibilities in areas of snowfall. A High Wind Watch has been issued for the Valley. Heavy rainfall could also cause localized urban and small stream flooding, so an Areal Flood Watch is in effect Wednesday night. Keep an eye on our website for updates to the hazard products. Light showers will continue into Friday with little to no accumulation expected. January 15, 2019 at 8:43 AM Today is a permissible burn day in Nevada, Placer, Plumas and Sierra Counties. Burning is always prohibited in the city limits of Grass Valley and Nevada City. A burn permit from the fire department is always required in Truckee. For maximum smoke dispersion, please burn between 9 AM and 3 PM. In the American and Thompson Valleys (all areas within the Quincy Fire Protection District), residential open burning is prohibited until March 16. Burning is always prohibited in downtown Quincy and East Quincy. It is illegal to burn painted or treated wood, plywood, plastic or anything other than natural vegetation from the property where you are burning. It is also illegal to burn piles comprised mainly of leaves or pine needles. For maximum smoke dispersion, please burn between 9 AM and 3 PM. January 15, 2019 at 8:41 AM Widespread precip today, much stronger storm on Wednesday/Thursday. A series of winter storms will bring heavy precipitation to NorCal this week. Heaviest precipitation is expected Wednesday – Thursday, which could result in localized flooding. Be prepared & never drive into flooded waters! Strong southerly winds will accompany the strong winter storm Wednesday. The strongest winds are expected to occur Wednesday afternoon – late Wednesday night with gusts up to 50-60 mph. January 15, 2019 at 8:21 AM Traffic break on Hwy 49 near Crestview to drop a hazard tree. Northbound traffic is backing up near LaBarr Meadows. January 14, 2019 at 5:33 PM Traffic is backed up from the accident, lanes are starting to clear now. Please use extreme caution on the area. January 14, 2019 at 5:28 PM First units at scene on Hwy 20 report minor or no injuries in the three-car crash. They can handle with the resources at scene. 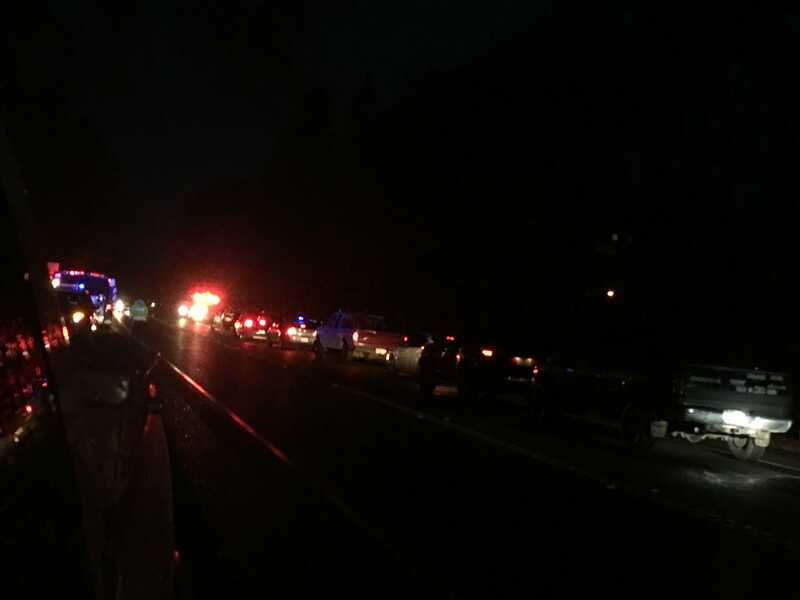 January 14, 2019 at 5:21 PM Multi-car vehicle accident on Hwy 20 near Cattle Drive. Emergency services are en route. January 14, 2019 at 2:36 PM Flood Watch in effect from Wednesday afternoon through Thursday morning. The National Weather Service in Sacramento has issued a Flood Watch for a portion of Northern California, including the following areas, Carquinez Strait and Delta, Central Sacramento Valley, Clear Lake/Southern Lake County, Motherlode, Mountains Southwestern Shasta County to Northern Lake County, Northeast Foothills/Sacramento Valley, Northern Sacramento Valley, Northern San Joaquin Valley and Southern Sacramento Valley. * Moderate to heavy rain can be expected during this period. Local rainfall amounts up to 3 inches possible in the Central Valley, and up to 6 inches in the Foothills. * Local ponding of water on roadways, rises on small streams and creeks, and mud slides or debris flows over recent burn scar areas are possible with heavy precipitation. January 14, 2019 at 10:10 AM Additional units are being released from the incident in Alta. January 14, 2019 at 8:17 AM Today is a permissible burn day in Nevada, Placer, Plumas and Sierra Counties. Burning is always prohibited in the city limits of Grass Valley and Nevada City. A burn permit from the fire department is always required in Truckee. For maximum smoke dispersion, please burn between 9 AM and 3 PM. In the American and Thompson Valleys (all areas within the Quincy Fire Protection District), residential open burning is prohibited until March 16. Burning is always prohibited in downtown Quincy and East Quincy. It is illegal to burn painted or treated wood, plywood, plastic or anything other than natural vegetation from the property where you are burning. It is also illegal to burn piles comprised mainly of leaves or pine needles. For maximum smoke dispersion, please burn between 9 AM and 3 PM. January 14, 2019 at 8:11 AM Series of storms to bring at times heavy precip and very gusty winds throughout the week. A wet week is in the forecast beginning tonight and Tuesday! Multiple weather systems will bring more rain and mountain snow to NorCal. The strongest storm will be Wednesday into Thursday and could have major travel impacts. 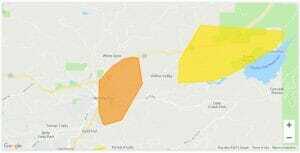 January 13, 2019 at 11:13 PM Approximately 168 customers out of power in Big Oak Valley. PG&E assessment crew is en route to the outage. January 12, 2019 at 10:15 AM Fairly dry weekend, significant wet weather returns next week. A series of wet systems will bring periods of widespread rain & heavy mountain snow next week. Stay tuned for forecast updates as details become more clear! January 11, 2019 at 11:59 AM Non-injury accident on Dog Bar Road near Alta Sierra Drive. The roadway is clear. January 11, 2019 at 9:40 AM CHP Helicopter H20 is over the area now. Motorcycle last seen on Tyler Foote and Jackass Flats. January 11, 2019 at 9:35 AM Law enforcement is attempting to stop a motorcycle rider wearing a tan jacket and a white helmet on the San Juan Ridge. Use caution in the Oak Tree/Tyler Foote area. January 11, 2019 at 7:39 AM Falcon 9 has landed back at Vandenberg recovering platform. January 11, 2019 at 7:30 AM You may see a bright light in the sky within the next few minutes to the south. SpaceX is launching 10 Iridium NEXT satellites from Space Launch Complex 4E (SLC-4E) at Vandenberg Air Force Base in California. January 11, 2019 at 6:05 AM Today is a permissible burn day in Nevada, Placer, Plumas and Sierra Counties. Burning is always prohibited in the city limits of Grass Valley and Nevada City. A burn permit from the fire department is always required in Truckee. For maximum smoke dispersion, please burn between 9 AM and 3 PM. In the American and Thompson Valleys (all areas within the Quincy Fire Protection District), residential open burning is prohibited until March 16. Burning is always prohibited in downtown Quincy and East Quincy. It is illegal to burn painted or treated wood, plywood, plastic or anything other than natural vegetation from the property where you are burning. It is also illegal to burn piles comprised mainly of leaves or pine needles. For maximum smoke dispersion, please burn between 9 AM and 3 PM. January 11, 2019 at 6:03 AM Drizzle and fog through the weekend, heavier precip forecast for next week. A couple of storms will bring relatively light precipitation to northern California over the next few days. Impacts from these storms will be minimal over Norcal. Storms next week are expected to have a more direct track on the north state and therefore are expected to bring more significant amounts of precipitation. January 10, 2019 at 9:39 AM Today is a permissible burn day in Nevada, Placer, Plumas and Sierra Counties. Burning is always prohibited in the city limits of Grass Valley and Nevada City. A burn permit from the fire department is always required in Truckee. For maximum smoke dispersion, please burn between 9 AM and 3 PM. In the American and Thompson Valleys (all areas within the Quincy Fire Protection District), residential open burning is prohibited until March 16. Burning is always prohibited in downtown Quincy and East Quincy. It is illegal to burn painted or treated wood, plywood, plastic or anything other than natural vegetation from the property where you are burning. It is also illegal to burn piles comprised mainly of leaves or pine needles. For maximum smoke dispersion, please burn between 9 AM and 3 PM. January 10, 2019 at 9:38 AM Light weekend precipitation, trending wetter next week. Dry weather into early Friday with a high probability of dense morning fog in the Valley. Periods of light precipitation through the weekend. More precipitation is on the way next week with the potential for significant mountain snow, although model differences currently bring lower confidence in storm intensity. 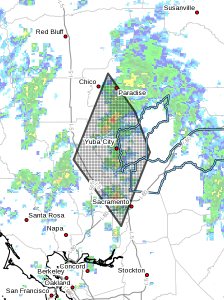 January 9, 2019 at 2:49 PM At 2:38 PM PST, a strong thunderstorm was located near Gridley, or 10 miles west of Palermo, moving northeast at 20 mph. Other showers and thunderstorms will be developing from around the Sacramento area northward into the central Sacramento Valley this afternoon. Small hail and brief downpours are possible with the stronger storms. Locations impacted include: Sacramento, Chico, Davis, Woodland, Paradise, Oroville, Marysville, Palermo, Yuba City, West Sacramento, Lincoln, Gridley, Colusa, Thermalito, Dunnigan, Zamora, Olivehurst, Pennington, Oroville East and Tisdale. January 9, 2019 at 8:29 AM Unsettled today, dry Thursday and Friday before the next wave of rain and snow. January 9, 2019 at 8:11 AM One lane is blocked on Ridge Road in front of NU after a two-car accident. Emergency services en route. January 9, 2019 at 8:07 AM Dog Bar Road is closed at Placer Hills Road after an accident. A power pole is blocking all lanes and phone lines need to be moved or cut. I just wanted to thank the GV Fire Department and PG&E for taking care of the tree/electric pole collision yesterday. Even though it took a while due to the problem, they got the electricity back on a little after 10 o’clock in the rain and wind. Thank you to all of you.